Raw Pet Foods for Cats and Dogs offers a convenient balanced complete frozen BARF diet already minced, mixed and packaged in convenient portion sizes. There are exceptions to feeding totally raw, as with anything, which will be discussed by your holistic practitioner. The main exceptions occur in older dogs that have a tendency to get very chilly or find it hard to digest raw food properly. Their digestive fire has gone out and first needs to be repaired using holistic healing. In these cases a raw diet can be cooked and special enzymes added. 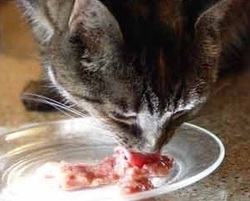 Some cats will eat raw chicken necks and chicken wings. This is highly encouraged. When giving bones, they may not feel like eating their next meal. This is quite normal and acceptable. Some cats naturally starve themselves for 12-24 hours once a week or so. Do not be alarmed, this is also normal. They may eat grass and eliminate fur balls during this time.